SC Estate FINE JEWELRY - Gold, Sterling, Genuine Gemstones ~ $10 Start ~ No Reserve! 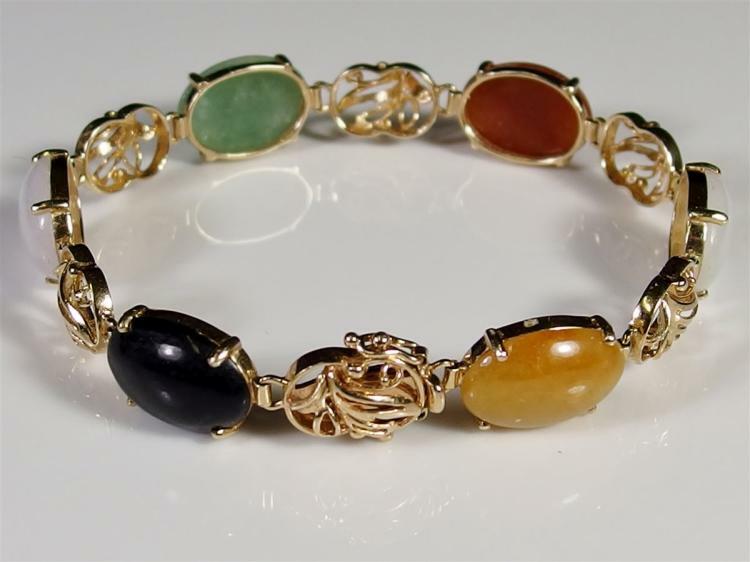 Auction Description for Seymour Auctions: SC Estate FINE JEWELRY - Gold, Sterling, Genuine Gemstones ~ $10 Start ~ No Reserve! 150 Lots of Exceptional Jewelry from a SC Estate. The owner lived in Germany and traveled abroad most of her life where most of the jewelry was purchased. The jewelry is being sold by her heirs in South Carolina. All lots start at $10 with no reserves. Includes: Gold, Sterling, Diamonds, Rubies, Sapphires, Jade, Topaz, etc. Preview Monday, August 8, 10-6pm. All sales final. All items sold as is. Accepting cash, check, major credit cards, and wire transfer. We only accept American Express for US bidders. There is a 18% Buyers Premium. Add/Delete rights reserved. All items must be paid for day of sale or upon receipt of the invoice. Buyers may pay at the scheduled pickup time. The buyer's premium is 18% is added to the final hammer bid and is payable by the purchaser as part of the total price. There is a 3% discount for cash or checks. Pickup is available Tuesday and Wednesday 10am-7pm at the gallery. Bidders must have a paid receipt to pickup their items or be prepared to pay at pickup time. We will ship items purchased by online, absentee or telephone bidding at the high bidder's request. Most packing, shipping and insurance are handled by Seymour Auctions. To economize we will pack multiple items of similar size and type together if possible. Smalls will be shipped USPS First Class or Priority Mail with insurance (Flat rate will be used when appropriate) and signature confirmation for orders over $50.. All items must be insured and a nominal fee per box is added for packaging and handling.Questions regarding shipping costs, insurance and tracking should be directed to patty@seymourauctions.com. We ship within 3 days of payment. Please be sure your credit card information is valid and up to date before each auction to prevent a delay in shipping. All shipping charges are the responsibility of the high bidder. Description: 14K Gold Earrings, 3/4", 6.5g pierced with French clip back. Marked 14K 585 CY. Description: 14K Gold Pearl Hoop Earrings, 1" pierced. Marked 14K on backings. Lot 5: 14K White Gold Ruby & Sapphire Pin, 2-1/8"
Description: 14K White Gold Ruby & Sapphire Pin, 2-1/8". Two rubies and two sapphires. Marked '14K' and pictorial logo. Lot 7: Peter Brams Designs 14K Gold Lapis Lazuli Earrings, 7/8"
Description: Peter Brams Designs 14K Gold Lapis Lazuli Earrings, 7/8". Marked 'PBD 14K'. Lot 8: Sterling Silver Marcasite & Mother of Pearl Flower Brooch, 2-1/8"
Lot 4: 14K White Gold Sapphire & White Topaz Pendant, 1/2"
Description: 14K White Gold Sapphire & White Topaz Pendant, 1/2". 12 round diamonds encircling an oval sapphire. Marked '14 assay mark 34 0.30 ct'. Lot 11: Monet Rhinestone Chain Bracelet, 7"
Lot 10: 14K Gold Pearl Necklace with drops, 16"
Lot 15: Liz Claiborne Hummingbird Enamel & Rhinestone Brooch, 2"
Description: Liz Claiborne Hummingbird Green Enamel & Pave set Rhinestone Brooch, 2"
Lot 17: 14K Gold Amethyst & Pearl Necklace, 18"
Lot 21: 14K Gold Seed Pearl Choker Necklace 16"
Lot 25: 14K Gold Pearl Necklace, 20"